March 18, 2019 (Last Updated: March 8, 2019) - As an Amazon Associate I earn from qualifying purchases. 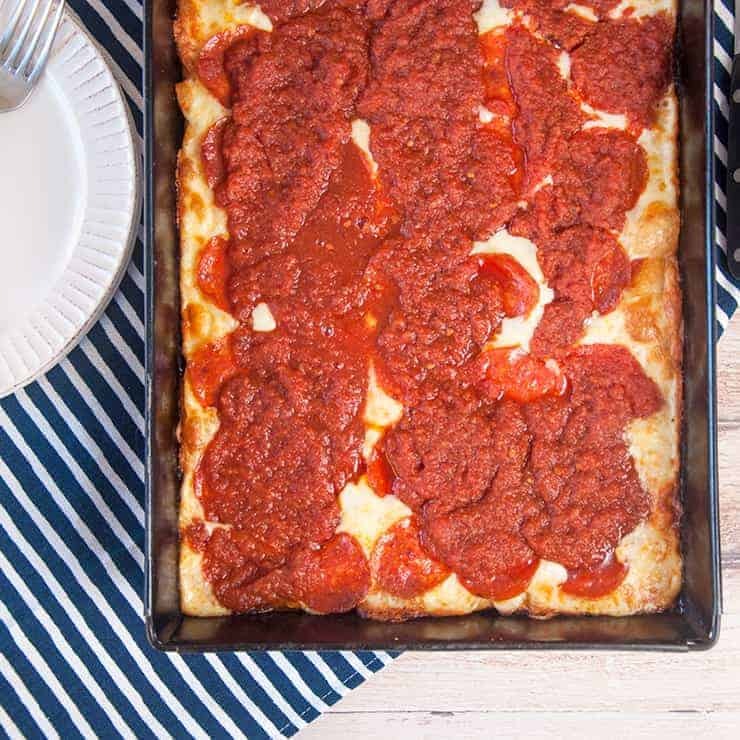 Today we are going to share our best Detroit Style Pizza recipe. There is much to love about this style of pizza. The wonderfully thick crust with nice crusty, slightly burnt, cheese edges, and all the pepperoni. 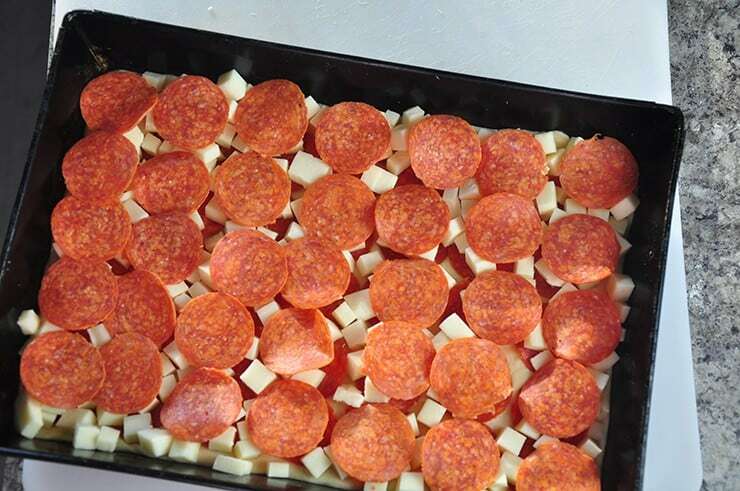 All the pepperoni. Yum. So much delicious stuff going on here. So, if you want to get a little nerdy about pizza with me, join me to make our perfect Detroit Style Pizza recipe. Well, this is vastly different from the traditional Neapolitan or NY Style Pizza. Instead of a fast baked crust, this is a thick style crust that is typically cooked in a rectangle pan. The pan, unique to this style, is said to originally come from Detroit’s car industry and were used to hold parts on the assembly line. These pans also started being used as pizza trays in the area. Before we actually cook our Detroit Style Pizza recipe, I traditionally like to investigate the history of a dish. I feel that food item’s history can help me understand the heritage and make a better end product. 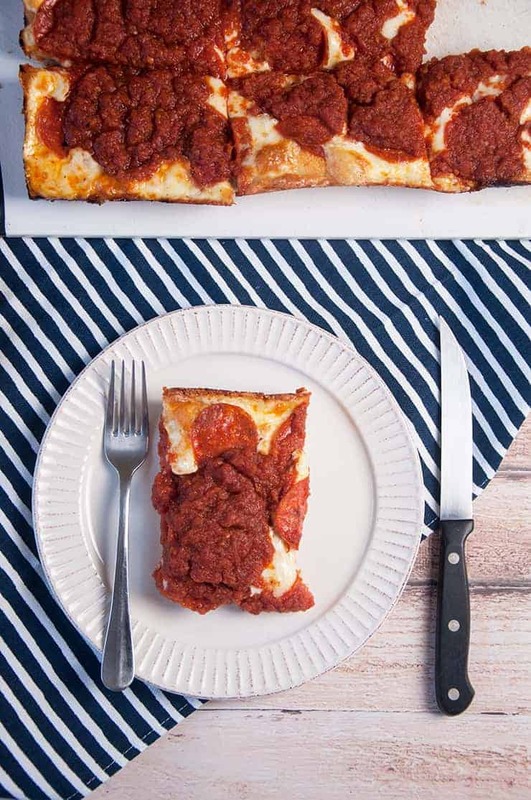 I did not grow up in Detroit and I don’t have a history of the pizza, so researching the history helps bring me closer to understanding what an authentic Detroit Style Pizza is. So, whether you are an old pro at this pizza or just getting familiar with Detroit Style pizza, I hope we can learn together in this look at the history of Detroit Style Pizza. If you know something that isn’t mentioned, let me know and I might add it! All recipes have a big bang moment and for the Detroit Style Pizza, it was at Buddy’s Pizza in 1946. Originally, Buddy’s Pizza was called Buddy’s Rendezvous and was primarily a bar, but in order to help make ends meet, they started serving food as well. In 1946, they added pizza to the menu and Detroit Style Pizza was born as the brainchild of one of the owners, Gus Guerra. Specifically, it was Gus’ wife, Anna’s, family recipe. Credit is owed to Anna on the pizza recipe, but Gus also incorporated a very important part of this style, the pan. One of the most interesting thing about the Detroit Style Pizza is the pan. While it isn’t an ingredient in the pizza, the pan is an essential part of making this style of pizza, but how did it come about? The automobile industry. You may be asking what the hell am I talking about, but hang with me. Detroit is world famous as a car town. Many car factories existed and small rectangle pans were used to hold various auto parts. These pans were widely available and Gus repurposed them for the pizza they were serving at Buddy’s Pizza. This decision helped create this style of pizza and is a trademark of a traditional Detroit Style Pizza! The Detroit Style Pizza was first created at Buddy’s in 1946, but the idea caught on. First, Gus Guerra separated from his partners at Buddy’s Pizza and ventured out onto his own when he bought Clover Leaf’s. Additional restaurants started serving up pizza in the same style. Places like Shield’s and Louigi’s Original started emulating Guerra’s pizza. It caught on like wildfire. One thing that I find really fascinating is the parallels that the Detroit Style Pizza has to Chicago Style. We previously wrote about the history of the Chicago Style and there are definitely some similarities. Both are thick crust pizzas. Geographically, they are somewhat close to each other. Both originated around the same time, although the Chicago style was in 1943. It almost makes me wonder if the Detroit Style Pizza was inspired by Uno’s Deep Dish Chicago Style Pizza? Or perhaps they are close enough in proximity and culture where the notion that this heavy sort of deep dish just naturally evolved simultaneously. Beyond that, each style had originators stake out on their own and new shops were created that served the pizza. 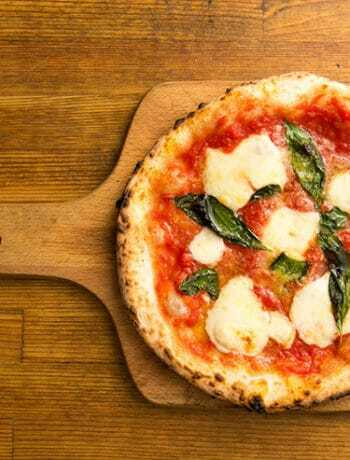 The popularity at one store made little pizza shop babies that evolved them to the iconic status that has now stood the test of time. I don’t know if one happened because of the other, but that these similar Pizza Styles came out of the same region at almost the same time is very interesting to me. In almost every large city, there are takes on Detroit Style Pizza. 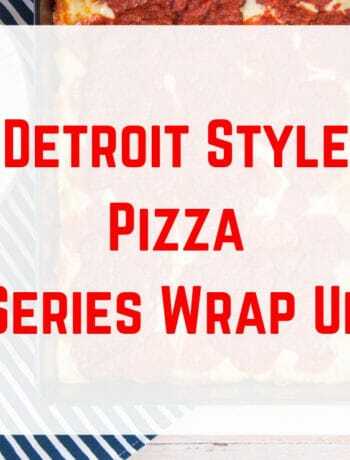 Little Ceasar’s was the first national brand to offer the Detroit style and is available today. This pizza is great and it has an interesting history with ties to the automotive industry, which seems so appropriate for a Detroit Pizza. Gus and Anna Guerra really created something special and a legacy of pizza that is being recognized nationwide! Now that we have the history covered, I feel inspired to get working on our Detroit Style Pizza recipe! Let’s take a look at the actual pizza! Other than the tray and shape, another identifying attribute of the Detroit Style Pizza is how the cheese is placed on the pizza. 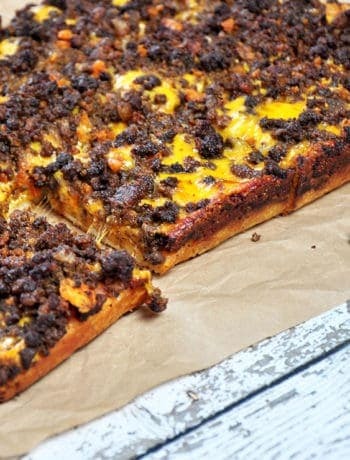 A good Detroit style pizza will have cheese along the sides that becomes almost burnt and helps form a nice crusty edge that is easily seen on the side of the crust. This style of pizza is similar to the Chicago Style Pizza Sauce in that the sauce goes on top of the cheese. Because of the cook time and temps, this helps prevent the cheese from burning. Yes, we do want our cheese to reach a nice golden brown and add to the crust, but we do not want it charred. The sauce is most often seen laid down on the pizza in three stripes. Unlike the Chicago Style sauce, this is a constructed sauce, whereas the Chicago Style is more of a drained tomato. Yes, my version is a simple sauce, but is distinctly different from it’s Chicago Style cousin’s sauce. Pizza toppings is a personal thing, but a commonality that Detroit Style Pizza shares with many pizzas is pepperoni. 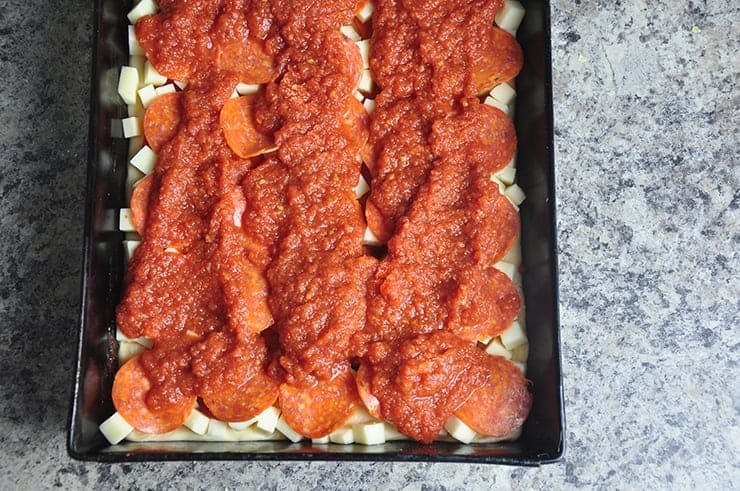 For this Detroit Style Pizza recipe, we are going to be using only pepperoni. If you use this recipe, use what you need to! I will say, however, that this pizza has moisture as an enemy, so try and drain any wet ingredients like jarred peppers, tomatoes, or olives. I Bought a Pan For This Pizza. So Should you. I picked up a 10 x 14 Detroit Style Pizza Pan from Detroit Style Pizza company and it worked really well. If you are going to get nerdy about this pizza, I suggest you do the same. I think you could use a different pan, but a main ingredient in this dish IS the pan. That it is square, steel, and thin metal that help make the Detroit Style Pizza what it is. It becomes ballet of ingredients. We want our cheese on top to become a nice golden brown. We want the cheese to be done just right, but we also want the crust to have a nice crispness throughout as well. A worst-case scenario might include a burnt top with a soggy crust. The pan helps make it what it is.. While my pan is thin, my Chicago Style pan, alternatively is thick and meant for withstanding 30 minutes of cooking time at a lower temperature. In our Detroit Style pizza recipe, we are cooking a thick crust pizza at high temps. We must get that heat to the crust as it was meant to. Having the appropriate steel rectangle pan helps that happen. I experimented with the temperature a bit in cooking this pizza. The best results were at high temp, but with the pizza being baked on the lowest rack. In combination with the conductive Detroit Style Pizza pan, this gave me an appropriate amount of heat to get the nice crust-like cheese on the edges, but also a done crust and completely melted cheese. 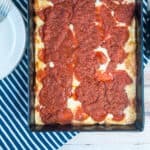 Moisture can pool in this Detroit Style Pizza recipe. This spends enough time in the oven for moisture to pool. 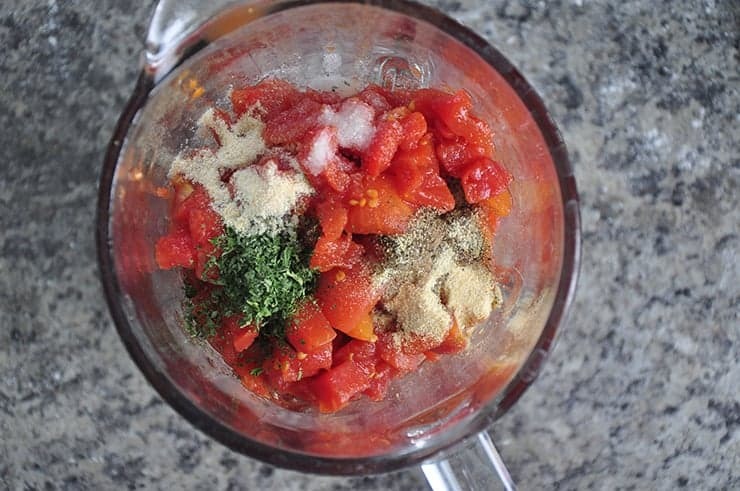 We drain the tomatoes before we use them and any toppings you use that have moisture are potential pizza problems. My wife likes pineapple and pepperoncini. Both of these are wet. I thoroughly drain them and pat them down with a paper towel. 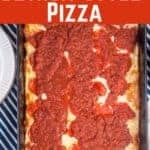 I hope you have enjoyed this Detroit Style Pizza Recipe. If you make it and love it, make sure to let me know and share it on Pinterest or Facebook! 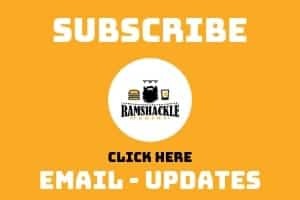 As always, you can keep in touch by subscribing to receive updates via email. I just love being able to learn about the history of a dish and then being able to try and make an authentic rendition of it! This Detroit Style Pizza recipe is special and super tasty. The thick, cheesy crust is so tasty and it is filled with a great sauce and delicious pepperoni. Add half of pepperoni, then cheese and spread evenly all the way to the edge. Then, add remaining pepperoni on top. Put sauce in three stripes across the top. Daaaamn now you got me drooling for a slice! Seriously thinking about ordering that pan and experiencing that myself! If you like deep dish, you will love this. 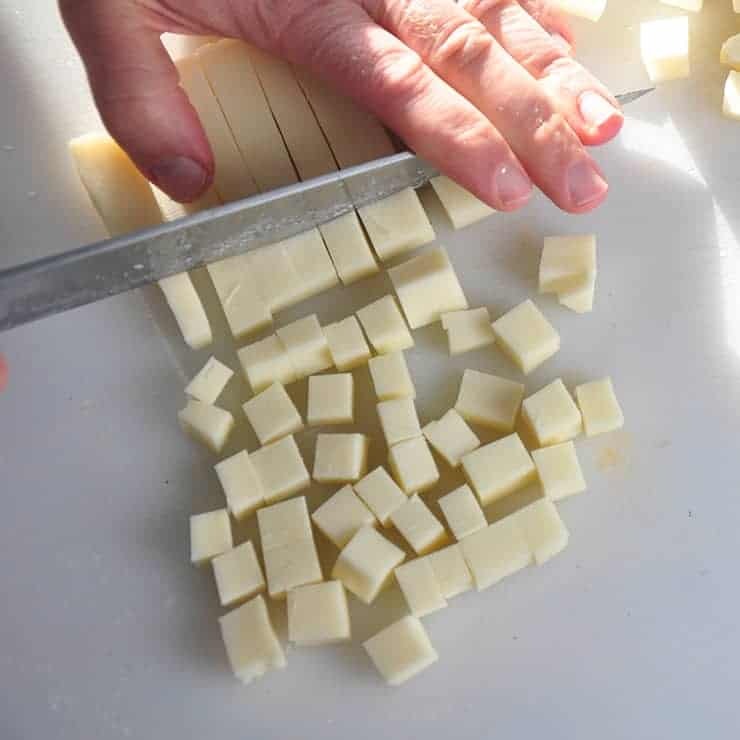 What a great idea to cut up the cheese into little blocks. I use the shredded and it seems like it’s never even! We will be trying this recipe this week.